For me, at least, the letters DIY conjure thoughts of fixing leaky faucets, installing ceiling fans, changing oil and replacing brake pads. Typically I choose the Do-It-Yourself option because it’s less expensive than the professional option. If I can do it as well as a professional, I usually do (My wife has a slightly different opinion of my home repair abilities, but we’ll reserve that for another time). When it comes to DIY and electronic cigarette liquid (or e-liquid), however, cost was never a good enough reason to get involved with it. Mixing juices seemed like a lot of effort to me and I really didn’t have much hope that I could create something that I actually liked. A contest prize from One Stop DIY Shop was what it took to get me started and my first several attempts at mixing and the e-liquid for my electronic cigarette pretty much confirmed my suspicion that this wasn’t for me. The juice I mixed ranged from mediocre to down-right disgusting and an awful lot ended up in the drain rather than in the atomizer. The typical DIY rationale of saving money seemed to be going down the drain right along with it. Unflavored nicotine base is cheaper than premixed electronic cigarette juice, but not if half of it is thrown away. Wanting to give it another try, I took advantage of a weekly special at Freedom Smoke USA [10% discount code: VGFSU10] and bought some Flavourart tobacco flavors. Suddenly, a combination of Latakia, caramel and English toffee had me actually enjoying what I had made in my electronic cigarette. This is going to sound odd, but the addition of a little cranberry turned it into one of my all day vapes for the last couple of weeks. It took some work and patience, as well as a dash of something a little off-the-wall, but DIY was finally working for me. I just got my starter kit from Vapor4Life, and all the flavors have a common quality that I am having trouble with. If I get blank cartridges and some all VG juice, do you think I will like it better? Thanks. Your comment is a reply to Eric’s article, but I’m more familiar with V4L and KR808D-1 cartos … and you don’t seem to be referring to DIY. VG per se won’t enhance flavor, but any good-tasting e-liquid (with a VG and/or PG base) – whether DIY or purchased premixed from a supplier – in a blank cartomizer will taste better than most prefilled cartos. Vapor4Life’s Premium and WOW blank cartos are pretty good (and I’ve read that LiteCigUSA’s Premium KR808D-1 cartos are also), but my favorite (by far) are the new Bloog MaxX Fusion. They’re a few cents more than V4L’s WOW, but well worth it IMO. And I like their prefilled ones as well, especially 555. YMMV. Yep! 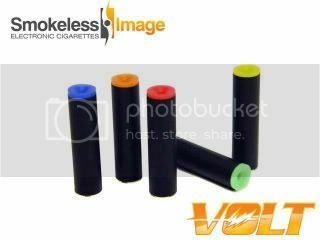 The Smokeless Image VOLT is the one I recommend these days. Didn’t know about those colored end caps, however. They do look neat … and are inexpensive: only $.50/five-pack. It’s still in its infancy, but I hope lots of people will share their favorite DIY-creations!